Are you there? Please share your stories, photos and videos with iReport. Eagar, Arizona (CNN) -- A huge wildfire in eastern Arizona grew Wednesday, prompting the Apache County Sheriff's office to order the full evacuations of two towns, home to about 8,000 people. Residents of Eagar and Springerville received the order late Wednesday afternoon, officials said. Other communities were warned they could be next. "We had a lot of spot fires today," said Jim Whittington, public information officer for the Southwest National Incident Management Team. Hot and dry conditions, with winds out of the southwest, continued to make firefighting efforts difficult, Whittington told CNN. While firefighters battled the fast-moving blaze, residents in its path faced serious choices: whether to stay -- and what to take with them if they leave. "We're going to get out of here because they want us out of here. That's the main reason," said Eagar resident Bob Meador. "We don't want to go." Authorities have evacuated thousands of people since the wildfire, known as the Wallow Fire, began sweeping through the Apache National Forest late last month. It had burned about 389,000 acres by Wednesday. Officials Wednesday said they feared flying embers could cause the fire to spread, and expanded evacuations. The fire was moving around the city Greer, subject of a Monday evacuation. It also was threatening New Mexico, where residents have felt the effects of smoke and ash. A firefighting team will operate out of Reserve, New Mexico, about 20 miles east of the border, Whittington said. On Wednesday, the front of the fire was just three miles away from the Meador family's Eagar Street home. Bob Meador and his son, Rodney, loaded what they could into a pair of pickup trucks. "We packed up a bunch, we're just hoping it ain't going to burn, hoping and praying," Rodney Meador said. Bob Meador, with his 18-year-old dog Tigger, prepares to evacuate his home as the Wallow Fire gets closer. But not everything fit, forcing them to make tough decisions. The Xbox made the cut, but family photos stayed behind. 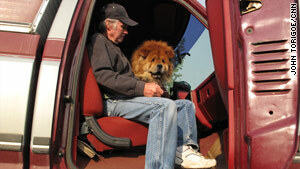 Their 18-year-old dog, Tigger, got a seat in the cab of the truck, but the family cat remained at home. Firefighters are focusing on saving homes in Eagar and nearby Springerville. But Bob Meador said he wasn't ready to take any chances. As smoke filled their neighborhood, the Meadors hit the road, hoping they would have a home to return to once the fire passes. "I've seen them wildfires in California just rip through places, so that's what I worry about," Bob Meador said. Next-door neighbor Dave Hunt, speaking before the evacuation order, said he was determined to stay, and was putting his faith in the roughly 2,500 firefighters who are battling the blaze. Earlier this week, Hunt -- a butcher at a local supermarket -- prepared 2,000 pounds of hamburger to feed fire crews. "We have so many firefighters here that are so into their jobs and the have protected other small communities that I know they are going to do a good job protecting Eagar," he said. The driveway of Hunt's home is lined with white stones, each a souvenir of a trip his father and stepmother took to the nearby White Mountains over 17 years. Fire has already engulfed most of the mountains where they vacationed, but the stones are reminders of good times, he said. "My dad built this place, and he's gone now, and I love this area so much. I've lived all over the country, and this is it. This is where I'm at," he said. Even so, he said he'll join the steady stream of residents heading for safer ground if conditions get worse. "I'm not a dummy. When the wind shifts when the ash starts to get heavy, when the smoke changes, it's time to go," he said. CNN's Phil Gast and Ben Smith contributed to this report.